Kathleen MacLean, Hera Nalam and Alissa Watson. Photo by Leif Norman. What does it take to be a hero? That’s not an easy question to answer, especially for children and young teenagers. Ready to take up the challenge, the Manitoba Theatre for Young People offers some examples of inspirational heroes in their latest performance, Torn Through Time. Three Manitoba playwrights (Carrie Costello, Frances Koncan, and Cherissa Richards) co-wrote the script, which focuses on a trio of historical female characters that are each worthy of a spotlight: peacemaker Thanadelthur, pioneering aviation instructor Helen Harrison, and Rose Fortune – Canada’s first female police officer. Although the play doesn’t focus on the individual stories of these powerful figures, it’s worth researching each woman and seeing how they contributed to shaping our country. Set in a junior high, the story focuses on main character Jess as she struggles to complete an assignment on her personal hero (in a moment that had both kids and parents laughing, the teacher on stage assures us that Patrik Laine is not an acceptable selection). Teased by her classmates for unorthodox selections, Jess doesn’t know who to choose. Luckily, she finds a history book filled with strong historical figures, who magically appear when pages are torn from the book. Reena Joly, Kathleen MacLean and Alissa Watson. Photo by Leif Norman. The rest of the story focuses on each character finding their inner hero, overcoming their own fears, and learning from each other to grow. With a nod to the sometimes-difficult years of middle school, there’s also a theme of coping with strong-willed classmates, and being true to yourself. There’s no better way to sum up the end of Torn Through Time than one of the last lines of dialogue by the intrepid Jess: “What they accomplished makes me wonder what I’ll become”. You couldn’t ask for a better takeaway than that, especially with such strong role models sharing the stage. The staging and production are all top-notch, with very creative props, puppetry, and a dynamic set used to great effect throughout the performance. There is a high degree of physical comedy, with the cast putting some serious energy into their performances, much to the young audience’s delight. 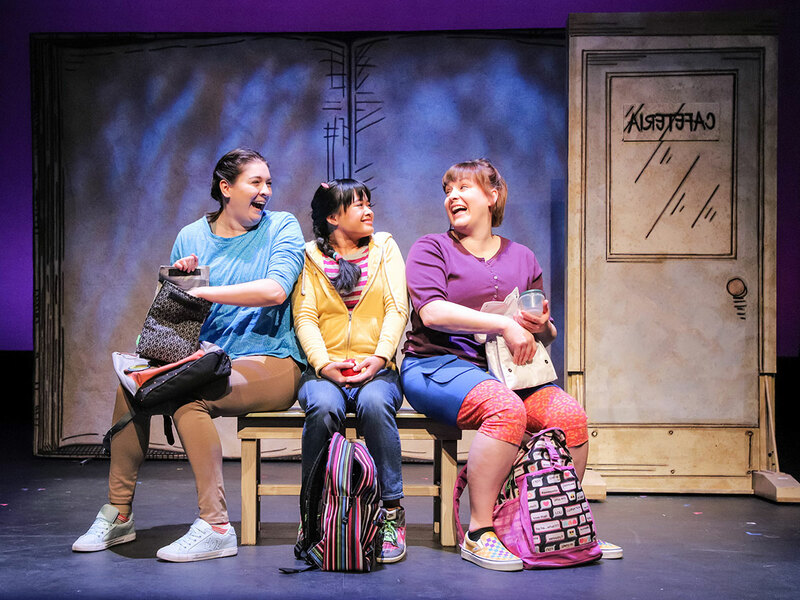 Most importantly, the play offers a look at several female role models, with a quiet heroism that will provide inspiration for theatre-lovers of all ages. Reena Joly and Kathleen MacLean. Photo by Leif Norman. Torn Through Time is recommended for ages 7-12. Get your tickets for one of the three remaining performances, including a relaxed performance on February 2 at 1:00 pm. Up next at MTYP for February is a spin on a classic Shakespearean tale. What if Romeo and Juliet… asks a question that is, in this writer’s opinion, long overdue: what if Tybalt puts away his sword, takes a deep breath, and calms down? Performed by Montréal-based DynamO Théâtre, this acrobat-heavy performance offers an introduction to Shakespeare for young audiences (recommended ages 9+), high-energy performances, and an extensive set design. Nos amis francophones will be able to enjoy a performance in French on February 23 at 4:00 pm.